I review a variety of books here on Carpe Librum, but Brick History by Warren Elsmore (from Allen & Unwin) was certainly a unique reading experience for me. 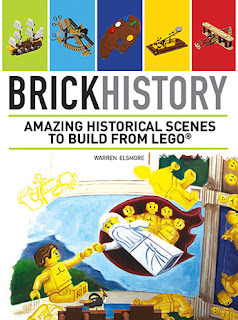 Containing detailed historical scenes made entirely from LEGO, Brick History begins with the birth of civilisation itself (Big Bang), and takes us through to the year 2011 with the Royal Wedding. When it comes to which historical events to feature in a book like this, you know at the outset that many significant historical events won't make the cut and that you can't please every reader. Having said that, I was surprised to see just how many American events were included, knowing the author Warren Elsmore is from the UK. The LEGO scenes were elaborate and it was obvious great care had been taken in their design to make them as historically accurate as possible. However, I just wanted more. I wanted to know how many LEGO pieces had been used in each scene or how many man hours it took to design and build each one. Without this information, and only stylised photographs to go by, it was difficult to appreciate the magnitude of the effort and creativity involved. There are several model projects with detailed instructions for readers to build themselves, and my personal favourite was a working sextant from Page 74 and a book of specimens from Sir Joseph Banks on Page 122. Brick History - Amazing Historical Scenes to Build from LEGO by Warren Elsmore will appeal to readers of all ages and of course Adult Fans of Lego (AFOL).